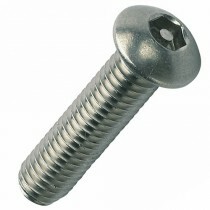 Pin hex button socket security screw stainless steel A2 (304). Pin hex security screws are tamper resistant and virtually impossible to remove without the special matching screwdriver. The central pin in the hex socket prevents the use of a standard hex key, ideal for prisons, hospitals, stations, councils, fabricators, schools, universities, telecoms, police stations, public utilities, museums, electronic and many other applications.